His seminal work, The World as Will and Representation, published 1818, influenced Wagner and Tolstoy, among others. We are not aware of any evidence that Schopenhauer was himself vegetarian, but his influence on later vegetarians was considerable. "The unpardonable forgetfulness in which the lower animals have hitherto been left by the moralists of Europe is well known. It is pretended that the beasts have no rights. They persuade themselves that our conduct in regard to them has nothing to do with morals or (to speak the language of their morality), that we have no duties towards animals; a doctrine revolting, gross, and barbarous." German philosopher, the author of The World as Will and Representation, one of the great philosophical texts of the nineteenth century. Although he had no genuine successors and founded no school, his influence was very widespread from about the middle of the century onwards, his most famous disciple being Richard Wagner, who believed that Schopenhauer had revealed to him the meaning of his own works and who then consciously pursued a Schopenhauerean line. 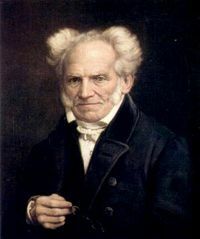 In the present century, Schopenhauer's philosophy of will has been one of the influences behind the development of existentialism and Freudian psychology. Schopenhauer. 1788-1860 - The chief interpreter of Buddhistic ideas in Europe, and whose bias in this direction is exercising so remarkable an influence upon contemporaneous thought, in Germany in particular. "Criminal history shows us how many torturers of men, and murderers, have first been torturers of the lower animals. The manner in which a nation, in the aggregate, treats other species, is one chief measure of its real civilisation. The Latin races as we know, come forth badly from this examination; we Germans not half well enough. Buddhism has done more, in this direction, than Christianity; and Schopenhauer more than all the ancient and modern philosophers together. The warm sympathy with sentient nature, which pervades all the writings of Schopenhauer, is one of the most pleasing aspects of his thoroughly intellectual, though often unhealthy and unprofitable, philosophy." "Thus, because Christian morality leaves animals out of account ..., they are at once outlawed in philosophical morals; they are mere "things", mere means to any ends whatsoever. They can therefore be used for vivisection, hunting, coursing, bullfights and horse racing, and can be whipped to death as they struggle along with heavy carts of stone. Shame on such a morality that is worthy of pariahs, chandalas and mlechchhas, and that fails to recognize the eternal essence that exists in every living thing, and shines forth with inscrutable significance from all eyes that see the sun!" "Since compassion for animals is so intimately associated with goodness of character, it may be confidently asserted that whoever is cruel to animals cannot be a good man." "The world is not a piece of machinery and animals are not articles manufactured for our use. Such views should be left to synagogues and philosophical lecture-rooms, which in essence are not so very different." On the fourfold root of the principle of sufficient reason, and On the will in nature; two essays. (PDF 29mb) by Arthur Schopenhauer, 1 -written 1813, expanded 1847. 2- written 1836. Translated by Mme. Karl Hillebrand, 1888, from 1875/78 editions. First published in London 1889. This edition 1903. p.115: "man...now no longer recognises animals as his brethren, and falsely believes them to differ fundamentally from him, seeking to confirm this illusion by calling them brutes,"
The Basis of Morality (PDF 25mb) by Arthur Schopenhauer (1788-1860). Translated with introd. and notes by Arthur Brodrick Bullock. First pub. 1840. This edition 1915. Schopenhauer (PDF 3mb) biography by Margrieta Beer, c.1914 p.32: He condemned vivisection, on the ground that animals have rights.